This is a truly unique cactus as it is the only species that is known from outside Southern America and Mexico to contain similar alkaloids to Lophophora williamsii and Trichocereus Peruvianus! Actually chemically it is extremely similar to Lophophora williamsii. This species is found in the West Indies and could be used in places where Peyote ceremonies can be legally conduced if Peyote was not available or as alternative more economical entheogen. It has indeed been analyzed via HPLC, GC/MS and TLC. All reports are conclusive and active in the desired alkaloids. Truly, a very special cactus. Grinding the dried pieces of skin and boiling it in half a liter of water for 8 hours can also make a tea. Filter and drink slowly. Itll be better though to make an extract by boiling the powder in 250 ml of water with the juice of 2 lemons for half an hour. Pass all of it through a handkerchief. Save the liquid and boil the San Pedro in 250 ml of water with the juice of 1 lemon for half an hour. Pass the liquid through a handkerchief again and repeat the last step. The juice is drunk in the course of half an hour. San Pedro can best be experienced in nature or in a quiet environment. Make sure you take care of the ambiance: candlelight instead of electric light, incense, etc. The right dosage should be determined experimentally. A normal dose of mescaline is anything from 0,3 to 0,8 grams, approximately the content of 3 to 6 inch of San Pedro with a girth of 3 inch. The content of mescaline can vary extensively between different cacti. You also need to consider bodyweight and individual sensitivity. Circa 10 grams of the dried San Pedro is a good average dose. Some people will feel unwell after ingestion of mescaline. To test your response, consume the San Pedro slowly, in the course of 45 minutes for example. The San Pedro cactus is hallucinogenic and visionary. Individuals with psychological problems should not use San Pedro at all. More than 1,5 grams of mescaline can cause liver-dysfunction and eventually death due to paralyzed bronchial tube. 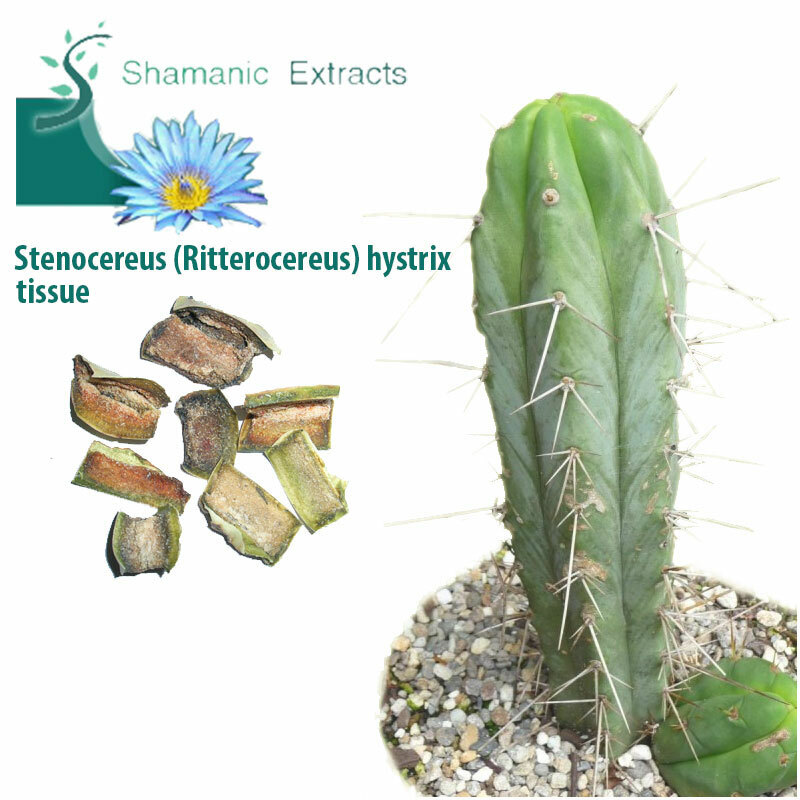 Share your experience about Stenocereus ritterocereus hystrix tissue with other customers. Submit your tips or thought on this product, be detailed and specific.